The passing of recent regulation makes Malta the first country to offer a holistic regulatory framework for distributed ledger technology operations, quickly affirming our nation as the ‘The blockchain Island’. These innovative government drives have naturally made the island appealing for crypto & fintech. Binance, the world’s largest cryptocurrency exchange, recently moved its base from Hong Kong to Malta, and other leading players like OKEx are coming too. Join us on the 15th October to learn more from Malta’s Junior Minister for Financial Services, Digital Economy and Innovation, Silvio Schembri about what the Maltese government is doing to regulate this new sector, and how Malta is becoming the leading innovator in the blockchain, cryptocurrency and other DLT technologies that are not necessarily financially focused. Hon. Silvio Schembri graduated with Honours and a Master in Economics at the University of Malta where he is today a visiting lecturer in Economics. As a Junior Minister within the Office of the Prime Minister, Hon. Schembri forms part of Malta’s Cabinet of Ministers and is responsible for a wide portfolio including the Malta Gaming Authority (MGA), The Malta Communications Authority (MCA), The Malta Financial Services Authority (MFSA), Finance Malta, The Malta Council for Science and Technology (MCST) and The Malta Information Technology Agency (MITA). Prior to becoming a Member of Parliament, Hon. Schembri, started his career as a banker with a private bank in Malta. He then advanced to the position of supervisor economist at the Central Bank of Malta. Later Hon. 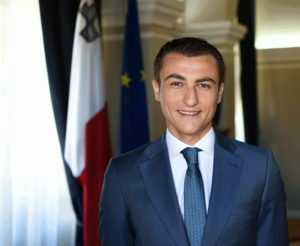 Schembri worked as a General Manager of the GAL Xlokk Foundation, advising private and public institutions including local councils within the South-Eastern Maltese territory, to access EU funding for capital and social projects aimed at helping further economic, social and cultural development.